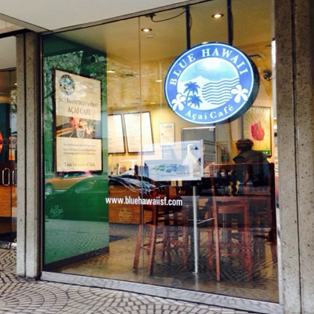 At Blue Hawaii Açaí Café, a local tropical wellness destination, it's okay to slow down, kick back, and enjoy a refreshing, filling snack. Whether you're stepping out of the gym or looking for a snack, you can indulge in our menu without feeling guilty. We're known for our açaí bowls; made fresh in front of your eyes. They're made with organic açaí, topped with organic granola, fresh banana, and berries. Then we finish them off with a drizzle of organic honey. We also offer a selection of all-natural smoothies, blended with organic soy milk and apple juice. With no dairy and no artificial sweeteners, our menu is filled with nutritious ingredients that are not only good for you but also taste great. Learn more about two unique ingredients that make the Blue Hawaii Açai Café experience unlike any other. We introduce organic açaí and spirulina. From Monday to Friday, starting at 11:00 a.m., we serve Hawaiian-style poke bowls. Our poke (pronounced Poh-kay) is made from wild-caught, sushi-grade ahi tuna. Using a dry marinade, it’s served over brown rice with a choice of mild, spicy, garlic, combination or gluten-free sauce and topped with furikake, ginger and kim chee. We opened our doors in May 2010. Our mission is clear — to deliver an experience and a menu, that's unique, healthy, and inviting. Visit us today. • Friday, 8 a.m. - 4 p.m.
• Saturday, 10 a.m. - 4 p.m.
• Subject to change during holiday periods.